Found in the whole central and western midland of South Africa, the more dry countryside of the wide open horizon even up to the west coast of the North Cape Province. This beautiful antelope wasn't chosen without reason to be the most well-known symbol of the South African sportsmen and women. In the nineteenth century, this antelope roamed the plain lands of the South African Karoo, Highveld and Kalahari sand dunes in their millions. Their massive migrations is still well documented : for many a traveler the most spectacular sight of his of her life (a sight which could cover an area of up to forty miles!) Today, although their numbers have dropped enormously, it is still found abundantly. 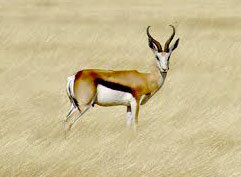 The abundance of white colour that the springbok feature together with the dark, almost black shading, mixed with the light brown skin, the pair of horns which together almost forms a heart shaped figure and the typical black stripe which connects the eyes to the nose, gives the springbok a most definite identity in the family of antelopes. And yet, none of that features could compare when this buck was first named : this antelope can, both in play and in flight, perform such a striking gymnastic jump, that it earned him the name as the jumping buck, the Springbok. From a standstill, or while in running, he suddenly takes of almost right into the air, hanging for a second in mid-air as if in slow motion, before shooting forward again with lightning speed. It's a typical South African gem to appreciate!